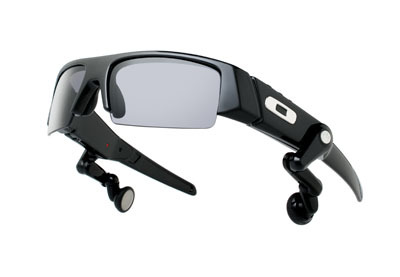 Oakley O ROKR sunglasses is a Bluetooth stereo eyewear from Oakley and Motorola. Oakley O ROKR other than functions as High Definition Optics sunglasses, O ROKR is also an A2DP enabled Bluetooth headset that can both stream and control audio and music from a A2DP Bluetooth enabled device such as Bluetooth-enabled phone or a portable music player with an add-on Bluetooth adapter, and listen the music on the speaker on sunglasses itself. Oakley O ROKR features lightweight O Matter frame, buttons for controlling volume, answering/ending calls and controlling music, lenses made of optically pure PLUTONITE which filter out 100% of all UVA, UVB, UVC and harmful blue light up to 400nm, able to change the lenses, and ability to use O ROKR with iPod by adding the optional ICOMBI adapter.